A full body workout in just 21minutes! Compression accumulates metabolites, such as lactic acid, amplifying the anaerobic exercise signal for muscle growth and repair. Cooling increases efficiency by delivering more oxygen to the muscles and aids in recovery and pain reduction. Customizable software enables interval training to be adjusted to any physical ability level. Low impact NuStep T5XR platform accommodates almost any physical limitation while reducing physical breakdown and fatigue. Placing compression on the arm and leg muscles while exercising at a low intensity has been scientifically shown to create the physiological effect of high intensity exercise. 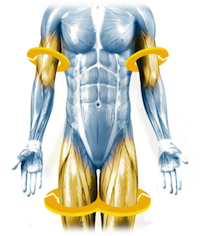 Compression cuffs worn on the arms and legs safely compress the muscle to quickly build up lactic acid, mimicking the physiology of an intense workout that would typically take extensive time and effort. Compression builds metabolite concentration quickly and activates fast twitch muscle fibers. This triggers a systemic recovery response, including the natural release of anabolic hormones such as testosterone. When your body temperature increases, blood vessels near the surface of the skin dilate, increasing blood flow to the skin, leaving less blood and oxygen for the muscles. When there is not enough blood to remove lactic acid from the muscles, the body hits a wall and fatigues. Remaining cool during exercise allows blood oxygen levels to remain high throughout the body which makes exercising much more efficient and pleasant. Sweating is also dramatically reduced or completely eliminated. Cooling the body during the workout mitigates further physical stress and reduces existing pain and inflammation. Each Vasper protocol is a 21-minute interval training protocol, delivered on a tablet fully integrated with the recumbent bicycle. Interval training involves a warmup period followed by a succession of sprint and rest intervals, scientifically proven to increase the efficiency of an exercise session. Each section of the interval training protocol is fully customizable, allowing for adjustments in duration, intensity, resistance, and speed. The pressure and cooling can also be modified for ability, comfort level, and performance. Heart rate monitors and a graph of power output is displayed on screen to track performance. Session metrics are also displayed at the end of the workout and can be emailed directly from the tablet.